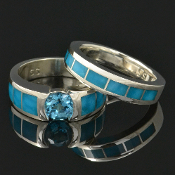 Our turquoise engagement rings are our most popular engagement ring choice. 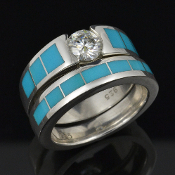 All of our engagement rings are available in sterling silver, Continuum silver (tarnish resistant), 14 karat white or yellow gold, and platinum. 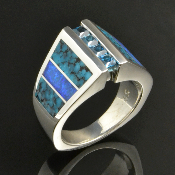 The prices shown are for standard sterling silver unless noted in the description as another metal. All other metals are an upgrade. 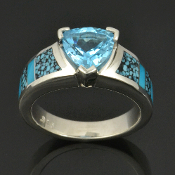 The turquoise options for our engagement rings range from greens to blues, with and without the spiderweb pattern. 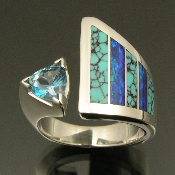 Our most popular turquoise choices are spiderweb turquoise from Kingman Arizona and birdseye turquoise, also from Kingman Arizona. 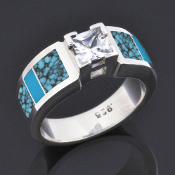 Many of our customers choose to have their engagement ring inlaid with spiderweb turquoise in an alternating pattern with plain blue Sleeping Beauty turquoise for a really unique look. 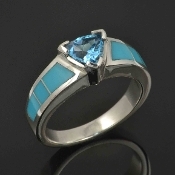 We offer several gemstone choices that look great with the inlaid turquoise. 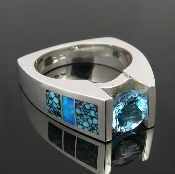 If you prefer a more traditional white center stone, you might consider white sapphire, moissanite or a diamond for your center gemstone. 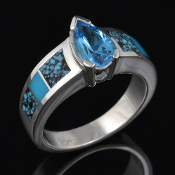 If you are a little more daring, we have several choices for blue gemstones or green gems that will complement your turquoise inlay choice. 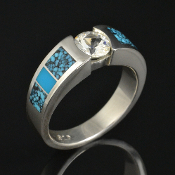 All of our inlay rings are made to order in your specific ring size so please allow us 4 to 6 weeks to make your new engagement ring.